This Encyclopedia brings together the vast array of historical research into the reality of the man, the teachings, the acts, and the events ascribed to him that have served as the foundational story of one of the world's central religions. This kind of historiography is not biography. 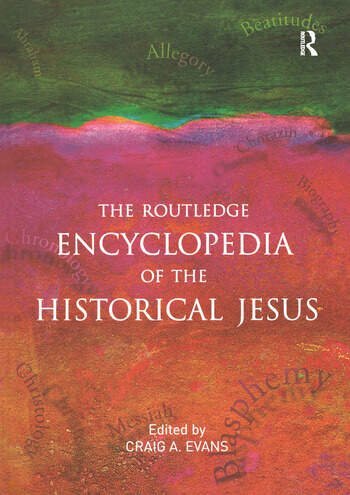 The historical study of the Jesus stories and the transmission of these stories through time have been of seminal importance to historians of religion. Critical historical examination has provided a way for scholars of Christianity for centuries to analyze the roots of legend and religion in a way that allows scholars an escape from the confines of dogma, belief, and theological interpretation. In recent years, historical Jesus studies have opened up important discussions concerning anti-Semitism and early Christianity and the political and ideological filtering of the Jesus story of early Christianity through the Roman empire and beyond. the history of the New Testament within the culture, politics, and law of the Roman Empire. New Testament scholar, Craig Evans, is the Payzant Distinguished Professor of New Testament at Acadia Divinity College of Acadia University, in Wolfville, Nova Scotia, Canada. A graduate of Claremont McKenna College, he received his M.Div. from Western Baptist Seminary in Portland, Oregon, and his M.A. and Ph.D. in Biblical Studies from Claremont Graduate University in southern California. He has also been awarded the D.Habil. by the Karoli Gaspard Reformed University in Budapest. A well-known evangelical scholar throughout the world, he is an elected member of the prestigious SNTS, a society dedicated to New Testament studies. After teaching one year at McMaster University in Hamilton, Ontario, Canada, Evans taught at Trinity Western University in British Columbia for twenty-one years, where he directed the graduate program in Biblical Studies and founded the Dead Sea Scrolls Institute. He was also a Visiting Fellow at Princeton Theological Seminary in Princeton, New Jersey. Author and editor of more than sixty books and hundreds of articles and reviews, Professor Evans has given lectures at Cambridge, Oxford, Durham, Yale and other universities, colleges, seminaries and museums, such as the Field Museum in Chicago, the Canadian Museum of Civilization in Ottawa and the Royal Ontario Museum in Toronto. He also regularly lectures and gives talks at popular conferences and retreats on the Jesus, Archaeology, the Dead Sea Scrolls and the Bible. Along with countless interviews on radio networks across Canada and the US, Evans has been seen on Dateline NBC, CBC, CTV, Day of Discovery, and many documentaries aired on BBC, The Discovery Channel, History Channel, History Television and others. He also has served as a consultant for the National Geographic Society.